Camelia is a very Modern and versatile aqua clean fabric corner sofa which commands the attention with the elegant and interesting design of side sections and tasteful stich lines that add individual character and uniqueness to this type of furniture. 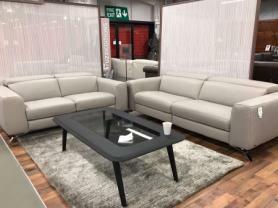 A sleeping function that allows to convert the sofa into sleep mode, a large bedding compartment and movable headrests that allow to adjust the backrest height to the most comfortable position – these are the additional features offered by this modern corner sofa that will appeal to both the fans of modern and classical style. High, chrome-plated legs add lightness and an exclusive design. Approximate Measurements: 266 x 213 cm, Depth: 102 cm.